For all families in our community, regardless of income. Life and death are unique and very personal experiences. When facing end of life, both the individual and their family experience a flood of emotions and anxiety. The Senator Bob Hooper House can relieve some of the stress and worry when someone is terminally ill and allow families to make the most of every moment they share together. With private rooms, gathering areas and overnight accommodations for loved ones, the beautiful and comfortable house feels like home. What makes The Senator Bob Hooper House truly unique is its deep support from the community. 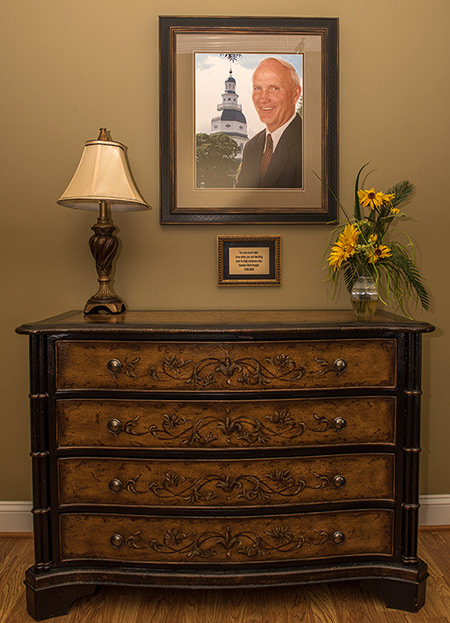 Whether it was the home and building industry coming together to offer their free services to build the property or the consistent support from fund raising year round, The Senator Bob Hooper House’s mission is important to many of the founders. The house was built for the community by the community based on the belief that every family should have a peaceful, supportive setting to come together during a loved one’s final days. In order to continue this promise today and into the future, The Senator Bob Hooper House relies on fundraising. My family and I pledged our leadership and support by joining many, generous neighbors and community partners to establish The Senator Bob Hooper House. The house is named for my dad, the late Senator Bob Hooper, because of our gratitude for the hospice care we received during his final days. Senator Hooper’s daughter and Board of Directors Chair. Senator Hooper was a vibrant, larger than life figure, who was always reaching out to his neighbors and making things happen for the community he loved so much. Representing the Maryland state senate, he was known as Senator “High Five” Hooper for the high-five greetings he gave at every session. His friendly demeanor and his very presence were known to put a smile on everyone’s faces. For all families in our community, regardless of income, to have access to compassionate, full service end of life care, close to home.